Why not learn to ring bells? Our oldest bell was cast in the 14th Century! Bell ringing is a team activity that stimulates the brain and helps to keep you fit. We have ringers aged between 10 and 80, and are always interested in increasing our numbers. You don't need to be strong, you don't need to be musical, you don't need to go to church. You just need enthusiasm to learn something new! We ring at Arborfield Church in Berkshire, in the south of England, a few miles south of Lower Earley and Reading, and a few miles west of Wokingham. We practice every Friday evening, jointly with ringers from Barkham Church. Our practice usually runs from 7.30pm - 9pm, focusing on the learners in the first half. We also ring before the Sunday morning services (9.30 - 10.00am), and after wedding ceremonies when required. However, we can't all go every week, and no-one expects that. We often ring at other towers in our area of mid Berkshire, and hold joint events with their members. Sometimes, we may simply go to the pub or out for a meal. We may visit other bell towers as well - in becoming a ringer, you will be welcomed by any other band of ringers in the country. 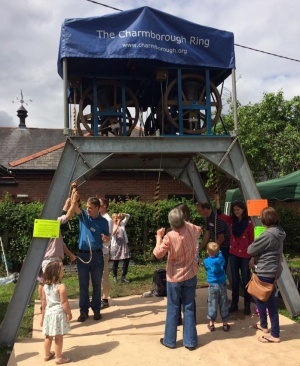 In June 2016 (pictured) and 2018, we demonstrated ringing at the Hurst Show. 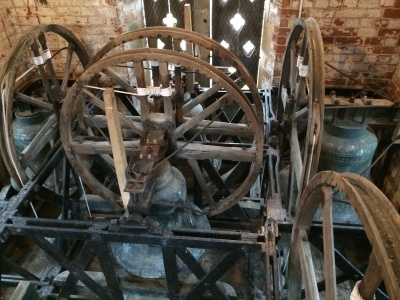 We often get visits from ringers from other towers. If you are a ringer and would like to visit us, please get in touch (we will normally respond very quickly); however we also don't mind if you come unannounced. I hope this has captured your interest. Please feel free to drop us a line, either through this form or our Facebook Page. You would be more than welcome to come along to watch us and see what it's all about, and maybe have a go at pulling a rope yourself!